An escaped Texas inmate craving a home-cooked meal is back behind bars after authorities caught him trying to sneak trays of food, bottles of booze and other contraband back into the prison. A rancher working on a property near the Federal Correctional Complex in Beaumont told the Jefferson County Sheriff’s Office that inmates from the facility were escaping and crossing into his land, police said. The tip prompted narcotics investigators and officers with the U.S. Marshals to set up a surveillance around the area in question. Deputies received information that inmates were escaping from the Federal Complex on the back side of the facility and crossing onto private land owned by a local rancher. It was reported that they were picking up contraband and taking it back into the facility. JCSO Narcotics Investigators and the U.S. Marshals set up a surveillance around 5:45 p.m.. A vehicle entered onto the private property and made a drop of a large duffle bag. At approximately 7:30 p.m., an inmate ran from the Prison grounds and grabbed the duffle bag. As the escapee was running back towards the Prison, Deputies made the arrest. The duffle bag contained 3 bottles of Brandy, 1 bottle of Whisky, multiple bags of Buglar tobacco, packaged snacks, fruit and a large amount of home cooked food. The escapee was identified as 25 year old Joshua Hansen of Dallas, Texas. He was in prison on Narcotics charges. He was booked into the Jefferson County Jail on the charge of Escape and Possession of Marijuana. He also has a Federal Hold placed on him. The investigation continues. The escapee was identified as 25 year old Joshua Hansen of Dallas, Texas. Authorities spotted a vehicle pull up to the property and drop off a large duffle bag around 5:45 p.m. on Wednesday. Just more than an hour later, an inmate made a dash for the bag and then raced back toward the prison, contraband in hand. Authorities arrested Joshua Hansen, 25, as he attempted to return to the facility. He was originally booked into the Texas prison on narcotics charges. 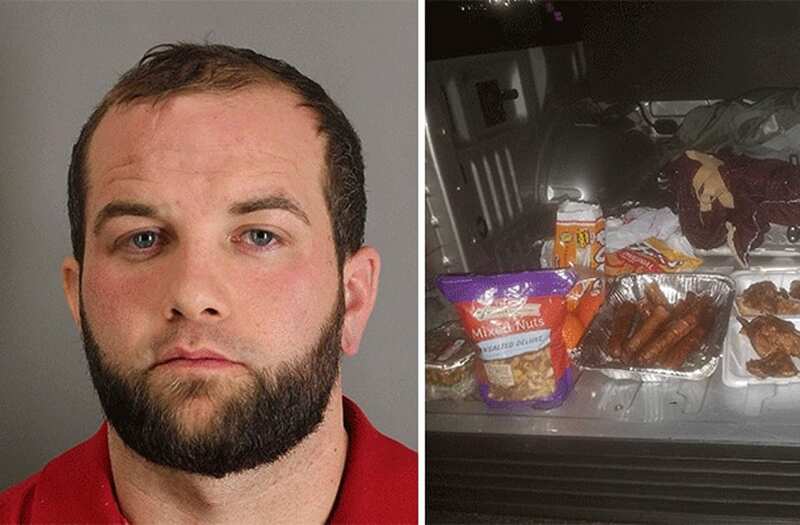 The duffle bag contained large trays of home-cooked food, three bottles of brandy, one bottle of whiskey, several bags of tobacco, packaged snacks and fruit, according to a press release from the Jefferson County Sheriff’s Office. Hansen was again booked into the Jefferson county jail on charges of escape and possession of marijuana. He could face additional time behind bars for the stunt.